Here is a popular Thai soup for people who enjoy growing and eating vegetables (it's a versatile soup that can be used with any vegetables). The most popular reason to eat this soup in Thailand is the belief that it helps mothers produce breast milk. We have a recipe to make this from scratch, or simply use this envelope for an instant version (you'll need to add mushrooms, babycorn, gourd of your choice and we like it with Chinese okra. Some people especially like this dish if it's seasoned with fish powder with chile. A convenient envelope packet, enough to make one large serving. Ingredients: salt, dried shrimp powder, shallot powder, galangal powder, white pepper powder, msg (no artificial color or preservatives). Product of Thailand. Kaeng lieng is prepared here and the final result is a very authentic Thai flavor. This is not something you're likely to find in a Thai restaurant, but if you're looking for a real "Taste of Thailand" then prepare this and enjoy it. Recipe: 1.5 cup kubocha squash, peeled and cut into dice chunks. 1.5 cups luffa (gourd). 1.5 cups fresh mushroom. 1 cup baby corn, cut in half. 12 medium shrimp, peeled and deveined. 1 teaspoon Mae Pranom fish powder with chile. 1 package Lobo brand kaeng lieng mix. 1 tablespoon sugar. 1/4 teaspoon salt. 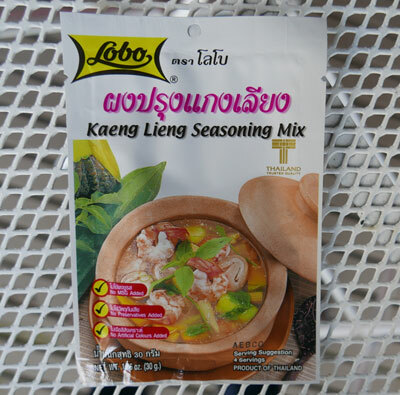 Method: In a soup pot boil 3 cups water and add the package of Lobo brand kaeng lieng mix. Add squash, baby corn, cook until softened, add luffa, mushrooms, shrimp, and cook until done. Season with sugar and salt. Enjoy!